Y is a free weekly publication that brings its readers quality, thought provoking, community sensitive views, and raises awareness on boundary scaling issues. Committed to being daring and vibrant, all the while upholding the responsibility as media to educate, inform and entertain without bias. The result is compelling content, and a fun and exciting experience, taking readers on a captivating journey. 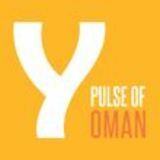 Y is read by the upwardly mobile community of Oman across all nationalities and ages. Y is available Free every Thursday across town from supermarkets to malls, cafes to gyms, cinemas, fuel stations and more across Muscat, Barka and all the way to Sohar.